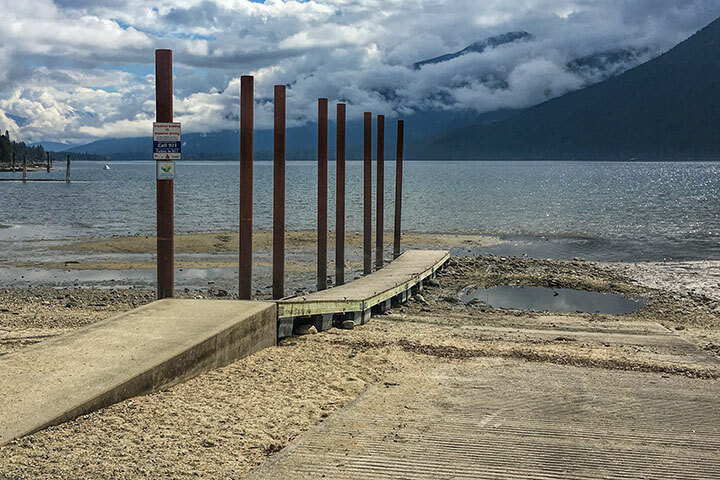 Kootenay Lake is at the lowest level I have seen it in the last couple of decades. The low water of March and April is, of course, an annual spring feature, which occurs when there is a reduced inflow because mountain moisture is still locked up as snow. This will reverse during the spring freshet of May and June when those snows melt and cause the Lake to rise to flood levels. Yet, sometimes the learning of a new word changes the focus of one’s perspective. That word is ullage: the amount by which a container is NOT filled. This is a term used in the beverage industry — although it is more broadly applicable — to indicate the unfilled headspace in a container. By the ullage measure, if the typical summer lake level is 531.3 metres above sea level, and the present level is 529.9 metres, then the ullage level might be said to be about 1.4 metres. Of course, if one judged what is full by the highest water level and chose the 2012 level at 534.5 metres, the present ullage would be over triple that at about 4.6 metres. Curiously, this rather high ullage is the reason that loons don’t nest on this lake. Certainly they visit, but since they build their nests along the shoreline, the high ullage range of this lake gives them problems. So, they nest on smaller mountain lakes which have a much smaller ullage. An illustration of the present rather high ullage is the Kokanee Creek boat launch. Consider the unlikelihood of being able to launch a boat from it today. This entry was posted in birds, commentary, weather. Bookmark the permalink. I certainly never have seen the beaches so deep as they are presently in Kaslo! High ullage indeed…so will be watching to see if it fills as high as normally.